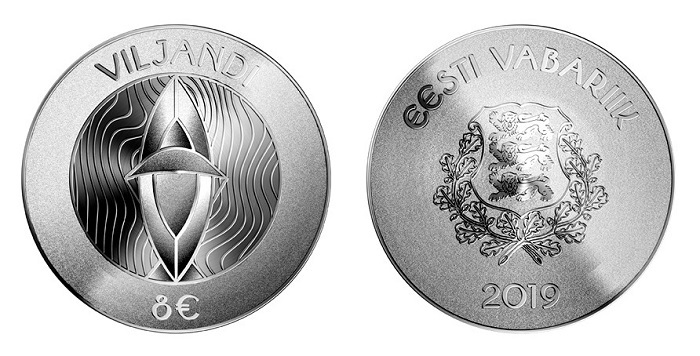 The Bank of Estonia has revealed (9th January) the design that will be seen on the country’s next silver crown collector coin which will be dedicated to Hanseatic Viljandi. The winning design was submitted from a student who attends the Estonian Academy of Arts. The Bank of Estonia’s expert panel, which decides the design and theme for Estonian collector coins, was convened at the end of 2018 and declared that Elisabeth Juusu, a student at the Estonian Academy of Arts, submitted the winning design of the competition arranged to find a suitable motif. The competition for the collector coin dedicated to the Hanseatic city of Viljandi was open only to students who were enrolled in the course for coin design at the Estonian Academy of Arts in the autumn semester. The visions of the students who tried their hand at the tricky task of coin design were brave and modern. We are looking forward to seeing these young designers enter the public coin design competitions of Eesti Pank. The winning design for the silver coin is called “Four Symbols” and features a medieval symbol for trade that brings together forms signifying fruits, fish, candles, and a merchant’s boat — common elements during the era of the Hanseatic League’s trade routes, which passed through the Baltic states from the middle of the 14th century. For centuries, the Hanseatic League was a unique phenomenon of German history and origin and played a significant role in shaping economies, trade, and politics in the North Sea and Baltic Sea. The long-distance trade routes made important Hanseatic cities such as Viljandi prosperous during this time. The town of Viljandi was first mentioned in 1283, upon being granted its first town charter. The town became a member of the Hanseatic League at the beginning of the 14th century and was one of five Estonian towns and cities in the league. With increased cooperation and mergers of merchants along these routes that promoted their trade further afield, at its height the routes were comprised of nearly 200 towns and cities. With the opening of trade to the New World and Asia, the popularity of the Hanseatic trade routes diminished in importance. Wars on the continent also lessened the routes, which were ultimately closed altogether. The silver coin will be minted with a nominal value of eight euros and will be issued this spring with a mintage of 4,000 pieces. Once issued, Elisabeth Juusu, who submitted the winning design for the new collector coin, will receive a prize 1,300 euros. For additional information about this upcoming coin and others issued by the Bank of Estonia, please visit their website.